While our 2019 Stewardship campaign is officially closed, we still have only about half the Commitment cards collected compared to last year. For those of you who have made a pledge, we thank you! For those of you who have not yet made a pledge, please fill out a Commitment card and deposit it into the sealed box in the back foyer of the Church. 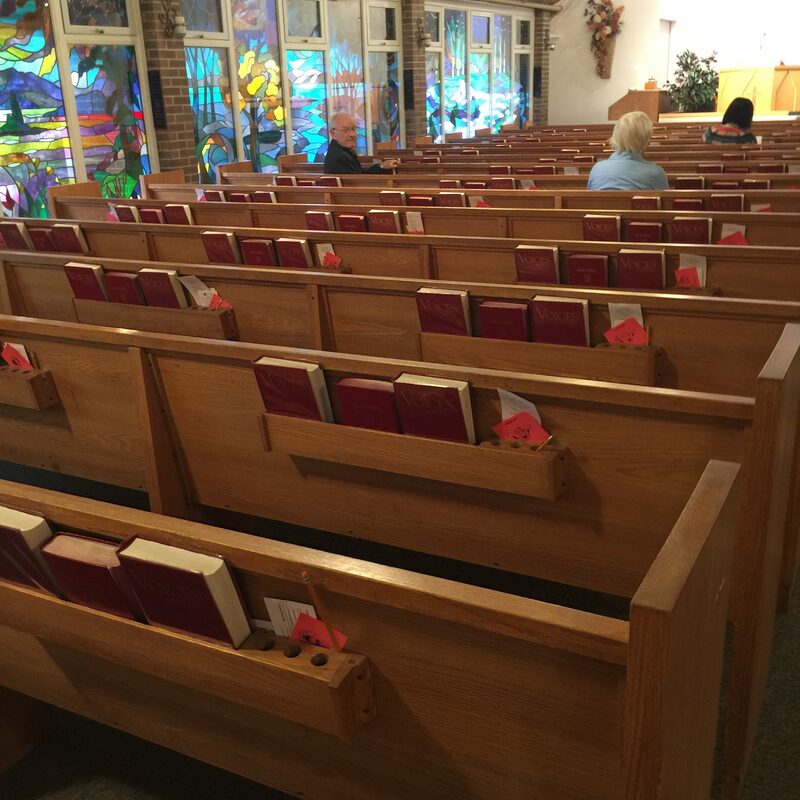 Extra commitment cards can be found in the back of the pews or scattered around the Church. Thank you from The Stewardship Committee! Our 2019 Stewardship campaign is coming to a close! “Our Generosity,” says the United Church, “is our response to God’s vast generosity in our own lives. It is a way to contribute to God’s mission in our world. What is God’s mission for us in our daily life? What is our mission in our community? How do we model compassion, provide community and offer hope? How do we serve God’s mission in the wider world? Paul reminds us that we are to give thanks always for the grace of God given us in Christ Jesus (1 Cor. 1:4). These thanks are made tangible through our gifts. Please consider this when filling out your commitment card with generous pledges of your time, talents and treasure for 2019. Please get in your commitment card today! We have so far received only about half the commitment cards expected. Remember, the Church needs you! When my husband and I entered into a marriage twenty five years ago, we too took that same approach. We give weekly and are on PAR. We have given to the church we have attended in all four provinces of which we have lived. We believe it is important for our children to know that we value our community of faith in our time (various committee work), talent (choir for me and fertilizer announcements for my husband) but mostly, we truly value giving of our income to this church at both the local and national levels. Why am I on PAR? Why do I give? I do so for the greater good. I do so for those people in need and I do so as this Christian church, and the freedom to worship as we choose, is important to me. A sermon that I once heard has always stayed with me and one might say that it encompasses everything that I believe about giving of one’s time, talent and treasure. This sermon was entitled ‘If every church member were just like me, what kind of church would my church be’. I give because I believe in my Christian faith, my church and the values we share. Please give prayful consideration to this phrase, “if every church member gave of their time, talent and treasure just like me, what kind of church would Maple Grove United Church be”. Our MGUC Narrative Budget – NEW with Harry’s input for the first time! Our Commitment Card for 2019, which we would ask that you either print out and put in the locked box in the back lobby of the church, or use one of the cards that can be found in the back of the pews. Payments can be made by PAR, cheque, cash or securities. Consider giving proportionally, but please do consider giving. Maple Grove needs you! Last year we struggled to meet our Stewardship goals until the end of the year when a final push helped us over the finish line. As a result we achieved our goals, allowing us to meet our funding needs both within the Church and our community. We are so grateful to all members of the congregation for their support last year in contributing over $280,000 of donations. “For you know the generous act of our Sovereign, Jesus Christ, who though he was rich became poor for our sake, so that by his poverty we might become rich.” (II Corinthians 8:9). God is the provider of an abundance of resources for our ministry and mission here at Maple Grove United. Our congregation is rich in faith, service, love, talent, life experience, care for one another, and financial capabilities. Communities of faith have many assets, including financial ones, with which to carry out their mission. We in Canada, and in Oakville area have been blessed with an abundance of wealth. How does our community offer thanks for God’s generosity and respond to God’s generosity by serving others? Did you know that our budget is raised entirely from folks in the pews? We do not expect donors to have an equal ability to give. We have about 120 families who contribute regularly to our financial picture. If they gave their “equal share”, it would amount to about $2,400 per family. If you are able to reach that mark, please do. For some, that is an unattainable stretch. For others, this is useful information in forming a giving strategy. 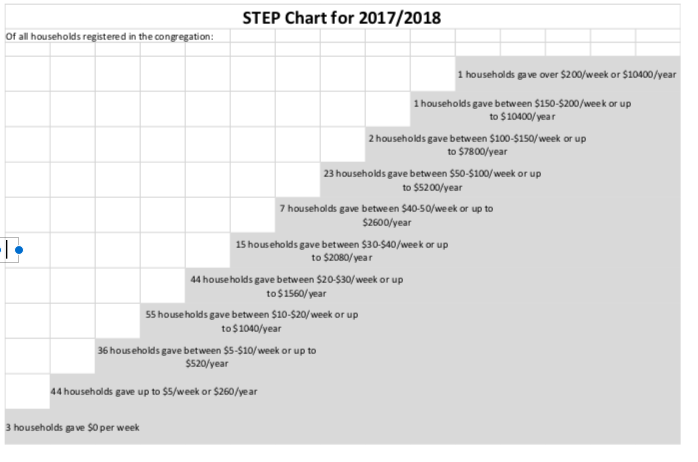 See also see the STEP chart on the next page indicating the profile of our donations for last year. Join us over the coming weeks as we hear how we are called in our worship and learning as Christians. We will share stories about why we give; how our generosity makes a difference here at Maple Grove; how we affect the community around us; and how, through the Mission & Service of the United Church, we respond to this call nationally and globally – all components of how we sing thanksgiving to help heal God’s World! help the organization run smoothly. We are also in great need of time and talent from members of the congregation to fill a number of roles in the church. We would ask that you consider filling out a copy of the Commitment Card that is attached, or in the back of the pews, to pledge your donations for 2019. Your commitment is a way of expressing your faith and joyfully acting upon it. Payments can be made by PAR (Pre-Authorized Remittance), cheque, cash, or securities. Consider giving proportionally, but please do consider giving. Maple Grove needs you! 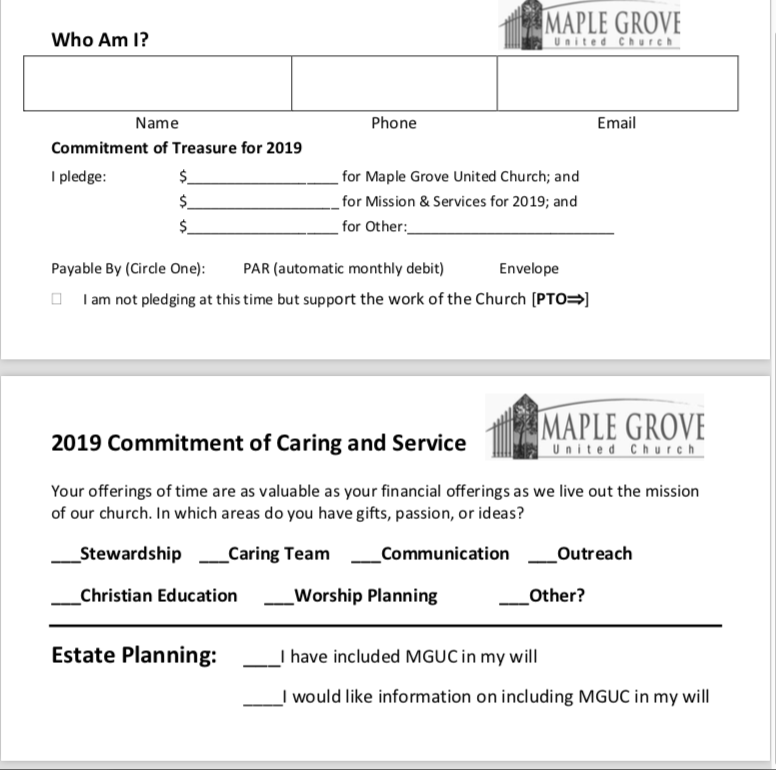 Please Fill out your 2019 Commitment Card Today (see below, or find in the back of the pews) and deposit in the Stewardship box at the Church, or leave it with Bobbi-Jo in the Church office. People of Christian faith and those who are curious about it are drawn into connection with God through Jesus. Believing “I too am a beloved child of God” frames how such people understand themselves. Some years ago a church insider claimed: “Stewardship is everything one does after one says, ‘I believe’.” It’s about seeking to honour our part of our covenant relationship with the God who richly blesses us, guides us, and upholds. It is expressed through lives lived with gratitude and generosity. At Maple Grove United your offerings sustain five areas of ministry. a quiet, compact opportunity to reflect on God’s Word and pray. Our mission includes a strong direction to reach out and serve others beyond our doors. We have a strong Outreach committee that focuses energy at three levels of activity – local, national and international. Our church has a strong ministry of outreach with its commitment to the Mission and Service fund of the United Church of Canada and we are strong supporters in this Region. We also support the work of the church through our forthcoming Regional Council assessments. This includes the work of Regional Staff covering congregations from West Mississauga to Niagara area and Brant/Haldimand Counties. The physical building we are blessed with includes not only our sanctuary, gym and meeting rooms but we also own the Manse on the property. Maintaining these buildings is vital in allowing us to live out our mission. Our congregation understands the importance of providing a safe, friendly and accessible communal space for us and others. Dozens of groups use our facility over the weeks and months of the year. These include: Western Heights Montessori Academy and Daycare, Little Kickers, Fourth Trafalgar Scouts, community yoga and volleyball.